IP69K is the highest ranking on the Ingress Protection rating scale, which means it has a very high protection against liquids and solids leaking into industrial devices. Products with higher IP ratings are designed to work better in harsh environments where standard sensors would easily get damaged and produce false readings. Various manufacturing industries, such as food, beverage, or pharmaceutical, have strict regulations in place in order to maintain a high level of sanitation and cleanliness and prevent the growth of potentially harmful bacteria. These rigid rules create an environment that is frequently subjected to high-pressure washdowns. Sensors and sensing components that do not function in this environment create costly downtime as production must be halted for changeovers and installation of replacement products. Installing products that are suitable for washdown and sterile environments is a must. 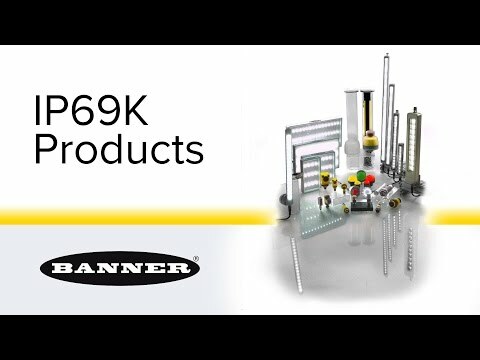 Fortunately, Banner Engineering offers a wide variety of products that are rated IP69K and can withstand the wet atmosphere and high-pressure that washdowns typically introduce. Banner's IP69K-rated sensors are available in a variety of housing styles and sizes and meet the demands of harsh caustic washdown environments without sacrificing quality. In addition, bright, long-lasting lighting and indicators are available with rugged design models that require no additional protective covers. Hostile industrial environments can shorten the life of any electronic component, which is why our products are built to perform reliably in the most challenging conditions. Our products undergo a rigorous process to ensure that they achieve a high standard of ingress protection, including an IP69K rating. Banner offers a wide variety of rugged products suitable for use in industries where dust and dirt can be an issue or where equipment must be able to withstand high-pressure, high-temperature washdown.